Heat oven to 350°F. 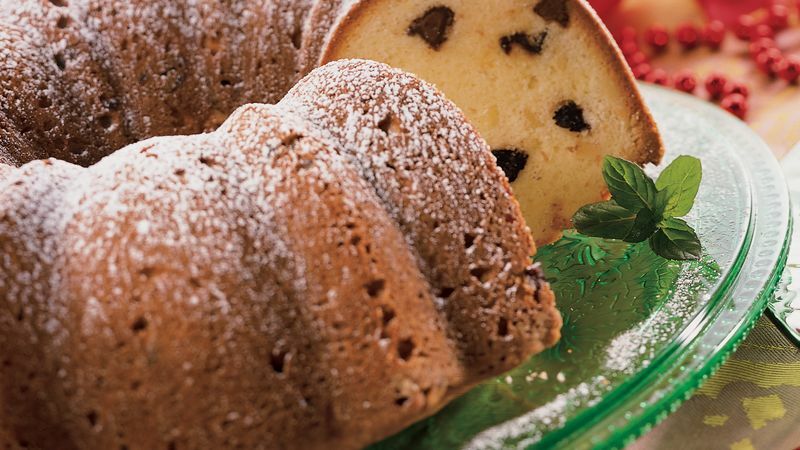 Grease and flour 12-cup Bundt® pan. In large bowl, combine sugar and margarine; beat until light and fluffy. Add sour cream, almond extract and eggs; blend well. Lightly spoon flour into measuring cup; level off. Add flour, baking powder and salt; mix well. Stir in chocolate chips, cherries and almonds. Spoon into greased and floured pan. Bake at 350°F. for 50 to 60 minutes or until toothpick inserted near center comes out clean. Cool in pan 20 minutes. Invert onto serving plate. Sprinkle with powdered sugar. Serve warm or cool. Look for dried cherries in the produce department, near other specialty or gourmet items. Sweetened dried cranberries can be used in place of the dried cherries. Bake and cool the cake; do not sprinkle it with powdered sugar. Wrap and freeze it. Thaw the cake at room temperature before unwrapping it and sprinkling it with powdered sugar.